SmartVault administrators can easily sign up for SmartVault's built-in e-signature solution, powered by DocuSign. If you have already created your DocuSign account via SmartVault, you can add SmartVault admins and users (employees) to your to DocuSign account for free. You can also help invited admins and users complete their DocuSign integration with SmartVault. Use your own DocuSign account: Each SmartVault user that needs to send documents out for e-signature should have their own DocuSign account, or the DocuSign account administrator will get email notifications and updates on every document on their account sent out for e-signature. Must be a SmartVault account administrator: Only SmartVault account administrators can create a DocuSign account via SmartVault or purchase e-signature Envelopes/KBAs. SmartVault users (employees) can only send documents out for e-signature. 2. Click the gear icon at the top of the screen. 3. 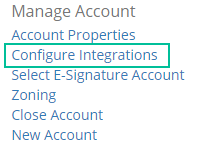 Click Configure Integrations under Manage Account. 5. Click Sign up for a new DocuSign account via SmartVault. 6. Confirm your name, account name, and email address you would like to use for your DocuSign account and then click Create your DocuSign account. Note: Only one DocuSign account can be created for each SmartVault account. You cannot use the same DocuSign account created via SmartVault across multiple SmartVault accounts. 7. 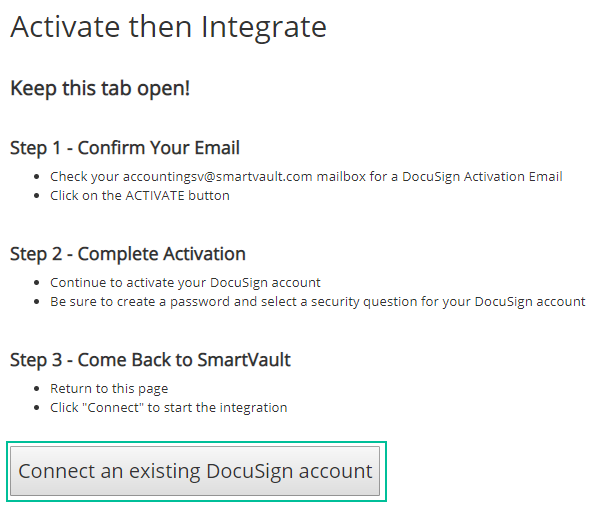 While keeping the SmartVault tab open in your web browser, open the activation email from DocuSign and click ACTIVATE. 8. Complete activation by entering a password, selecting a security question, and clicking ACTIVATE. 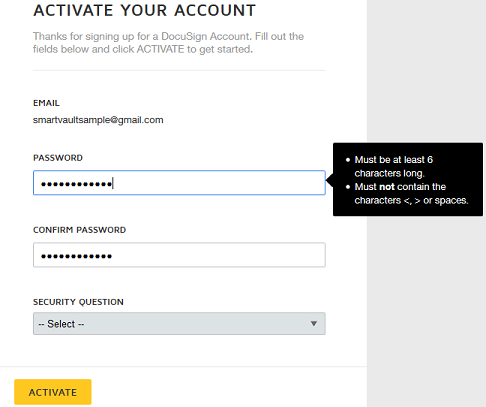 Once your DocuSign account is activated, you will automatically log in to DocuSign. 9. Go back to the SmartVault tab you left open and click Connect an existing DocuSign account. 10. Enter your DocuSign email address and click Continue. 11. Enter your DocuSign password and click Log In. 12. 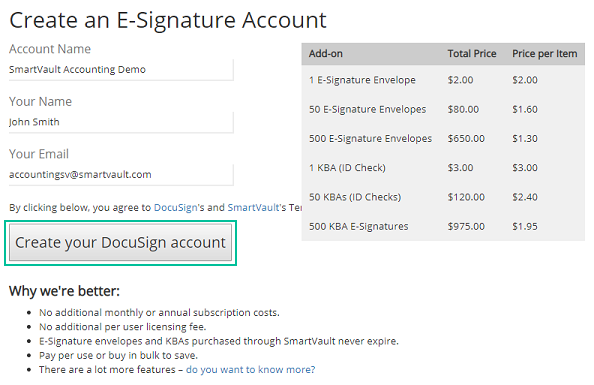 Click Accept to give SmartVault permission to integrate with your existing DocuSign account. The Purchase E-Signature Envelopes & KBAs page appears. 13. Enter the number of Envelopes and KBAs you want and click Purchase. Note: Buying bundles of 50 Envelopes or KBAs will save you 20%. Once your purchase goes through, you should see the Integration Complete page. You can now send files out for e-signature from the Connected Desktop or through the Files & Folders View in the Dashboard. 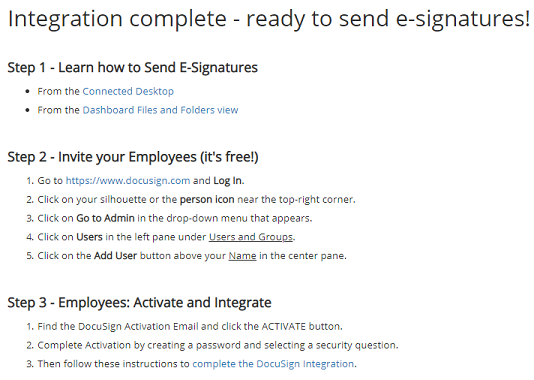 This page also provides instructions on how to send e-signatures, invite your employees to your e-signature account, and how employees can activate and integrate their account once invited.